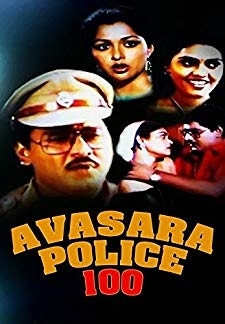 Avasara Police 100 is a 1990 Indian Tamil film, directed by "WriterK. Bhagyaraj" and produced by ,The film stars "K. Bhagyaraj, M. G. Ramachandran, Gouthami" in lead roles. The film. © 2018 Scratchu.com Avasara Police 100 | Bhagyaraj, Mounika, Nambiar, M.N. Nambiar, M.G. Ramachandran, Silk Smitha - Avasara Police 100 (1990) | Tamil Movie | 6.8/10 | Synopsis : Avasara Police 100 is a 1990 Indian Tamil film, directed by "WriterK. Bhagyaraj" and produced by ,The film stars "K. Bhagyaraj, M. G. Ramachandran, Gouthami" in lead roles. The film.... Watch Online!! !